Since France tightened border controls with Italy in mid 2017 many refugees have become stranded in Ventimiglia on the French/Italian border. 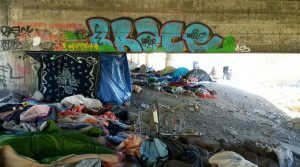 In the summer numbers swell, with hundreds of people sleeping under a big motorway bridge. As greater risks are taken to cross the border refugees have begun to lose their lives either on the mountains, roads or railways tracks. This winter temperatures dropped to minus 20 over the alps, but still people tried to cross, ill-equipped and at risk of frostbite, loss of limbs and death. Care4Calais sent volunteers early in 2018 with hundreds of new boots, new coats, thermals, gloves and emergency blankets. We now partner with a local group and we send aid when possible to boost their stocks of essential items.